This was a successful production in 2013 to 2014, and is now on a long tour with several of the original cast. I always wonder about long-running reprised productions (An Inspector Calls, The Play That Went Wrong) as usually the cast keeps changing as the months and years roll by. Here, the main parts are as at the highly-acclaimed start. Salisbury on a Saturday matinee, a good provincial theatre … this tour goes to the good ones. It’s virtually full. There are kids. There are old people. There are adults without kids. It’s a great cross-section in fact, not weighted young like a pantomime, but with lots of young people and kids too. This is surely the heart of theatre, exactly the sort of thing that the Arts Council should be ploughing funds into, rather than London. Salisbury Playhouse is a great theatre. The seats are well-raked, but unlike the Minerva at Chichester earlier this week have very good legroom, so much so that people can walk along a row easily without people standing. I guess it’s a “relaxed performance.” Four or five people went out to the loo and came back. There’s none of that strict-discipline no re-admittance, mainly because access is easy and the doors are not shared entrances with the action on stage. There’s a downside. I had a talker (this is good, isn’t it? several times) in my row, and a person in a wheelchair talked quite a bit on one side. But with this sort of lively production, the cast are perfectly able to cope with it. After three Shakespeare (all heavy ones … two King Lear and a Coriolanus) and a Marlowe in a fortnight, this was such an easy, fun thing to watch. Touring provincial theatre a its very best. Salisbury Playhouse is always so much better-attended than its counterparts in the much larger towns of Poole and Southampton. 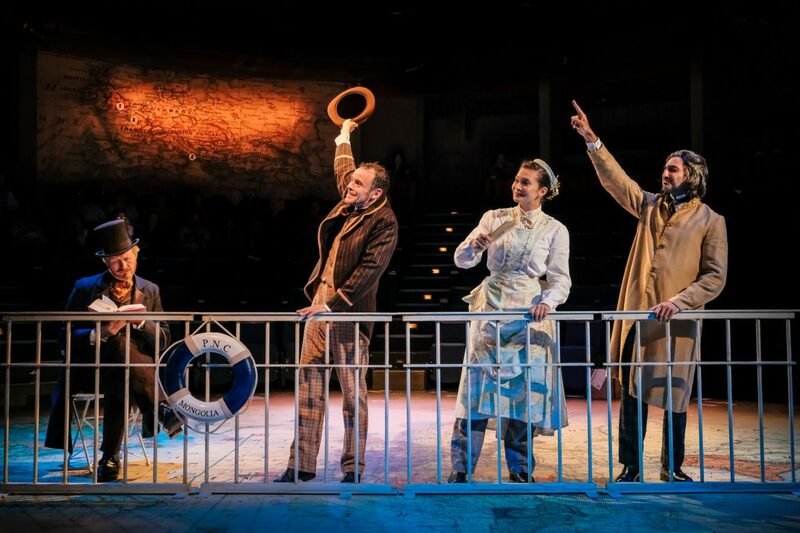 A hugely talented cast of 8 play over 125 characters in this imaginative high-spirited escapade including six trains, five boats, four fights, three dances, two circus acts and an elephant. The basic Jules Verne story is well-known, mainly because of the 1956 Michael Todd produced movie, one of my earliest cinematic memories, and thankfully a good one. Snow White and Dumbo both gave me nightmares for months. The 1956 production was a technical innovation, and my first “grown-up” film. It was filmed in “Todd-AO” and starred David Niven as Phileas Fogg and Mexican actor Cantinflas as Passepartoute. 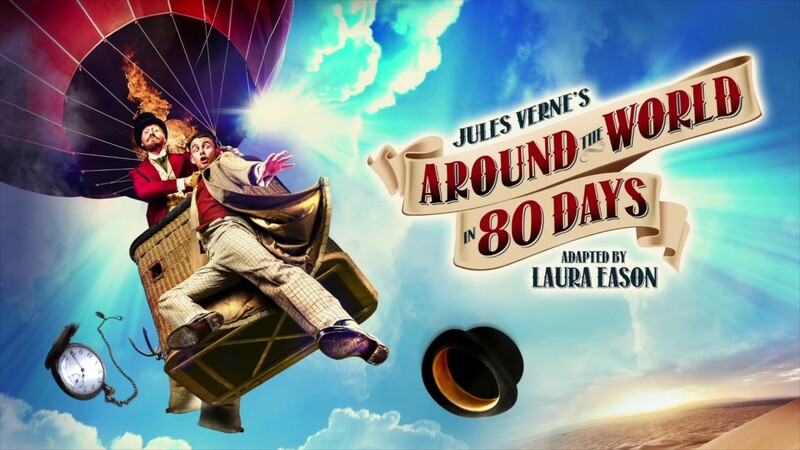 Phileas Fogg makes a £20,000 wager that he can travel around the world in eighty days. He takes a new valet, Passepartoute, with him. A detective, Inspector Fix, suspects him of being a bank robber and travels after him, causing as much mayhem as he can. In India, Fogg rescues Mrs Aouda from the practice of suttee (or sati). This was an Indian funeral practice where a wife threw herself on her husband’s funeral pyre, or committed suicide soon after. Mrs Auoda joins the party. They go to Hong Kong, then Yokohama, and cross the United States. Was it coincidence or cunning? I think the latter. 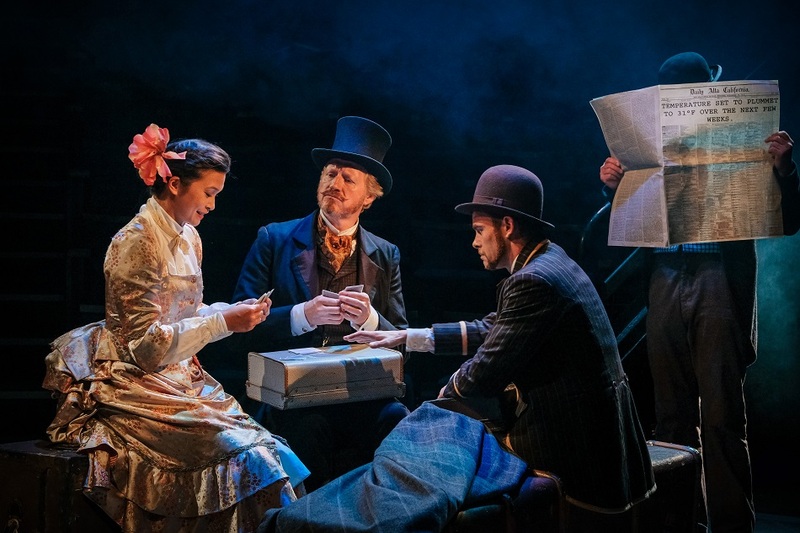 Phileas Fogg’s journey starts on 2nd October in the Salisbury production, the first day of the Salisbury run. I assume they change the date every week … which must be a swine to remember! Our 12 year old companion noted that one. It’s full of outstanding physical theatre. They’re playing to a first rate sound design, and hitting the points with meticulous timing. The fight scenes, all conducted across with full width of the stage separating the participants, are some of the very best and funniest I have ever seen. There is a running joke with throwing passports and paper money (the huge £5 notes of the 19th century) across the stage. Much of it was developed in rehearsal, according to the programme. Everyone has to dance, fight, act and do circus acts. There’s a good five minutes with barely a word at the start, as we watch Phileas Fogg’s daily routine. It’s stylised and hilarious. Andrew Pollard is Phileas Fogg. In a brilliant ensemble cast, I;m sure none will mind me saying that Passepartoute, played by Michael Hugo is the star of the show. Michael Hugo has the rare quality of being able to play his part, yet interact easily with the audience … he instigates the audience participation bits. He can stay in character, but step outside the play and comment. After the interval, he improvises and holds the audience rapt for a solo five minutes. Add the dancing, acrobatics and physical movement. The scene after Inspector Fix gets him stoned senseless on opium in Hong Kong is the funniest individual performance I have seen in years. I’ll add that in the curtain calls, he stood in line with everyone else and made no moves for solo bows. A lesson to others … though Sir Ian McKellen was equally humble in King Lear. The ensemble is the thing of course. 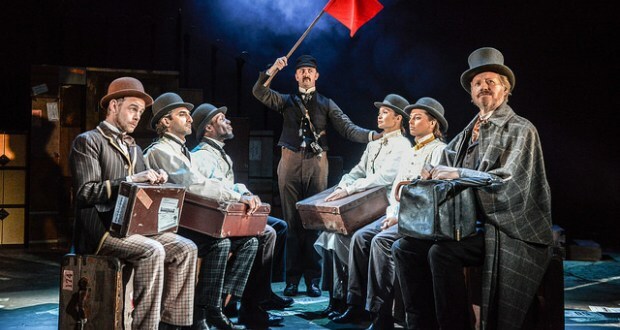 The costume changes are dizzyingly fast, as are the character switches … and Fogg, Passepartoute and Fix generally stay in character, leaving the other five to work their socks off with changes. It’s a stage management triumph as well … the programme notes that as much frenzied activity is going on back stage as on. A lot is the stuff of pantomime, but it isn’t the usual stuff you’ve seen before. It’s imaginative and inventive, and the audience participation bits are to help keep the show going, not extraneous. This is a long tour. Exeter, Manchester, Kingston, Finchley, Cambridge, Norwich, Derby, Coventry, Guildford, Liverpool are still to come. Don’t miss it if it comes your way.